Becca took this picture of us in January. It is one of my favorites because she captured Ethan's eyes perfectly. I was in Craft Warehouse during Christmas and Jeanean was creating the coolest cards with these snowflake buttons. So... I bought them all. ;) We used them on our own cards but I had extra. 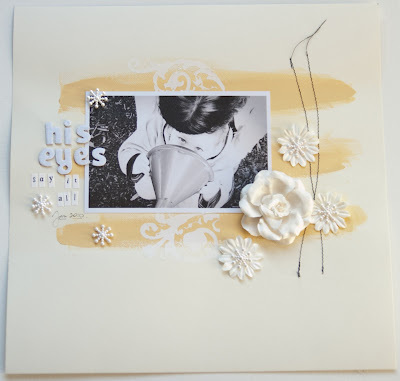 I loved using them on this page and as the center for the flowers. So cute! Create Well: Think outside the box and use decorative buttons in unique ways on your pages. 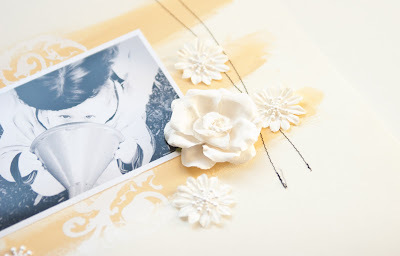 This is soooo pretty...love the colors you chose to use! 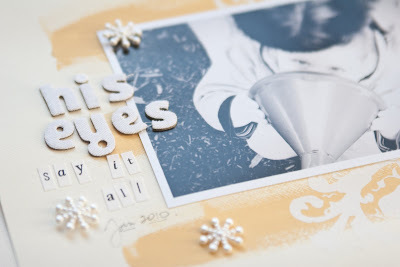 Your scrapbooking style is just about my favorite of everyone out there.